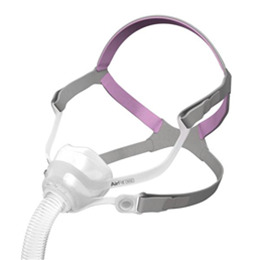 With its smaller design and pink accents, the AirFit™ N10 for Her delivers a full host of benefits for female CPAP users and is ranked as the top choice by patients among industry-leading nasal masks. Designed with minimal parts, the mask has an intuitive key-clip cushion with EasyClick™ self-aligning headgear clips to allow for easy use and reassembly. Additionally, the SoftEdge™ headgear allows you to feel more comfortable without having to worry about waking up with marks on your face. The AirFit™ N10 for Her also offers superior comfort for users and an under-the-eye frame that gives you a clear field of vision while the circular diffused venting system keeps exhaled air away from your face to allow a peaceful sleep.